Tod Browning’s silent horror film with a new, psychometrically recalibrated musical score performed live by THE KITSCH GEHENNA. 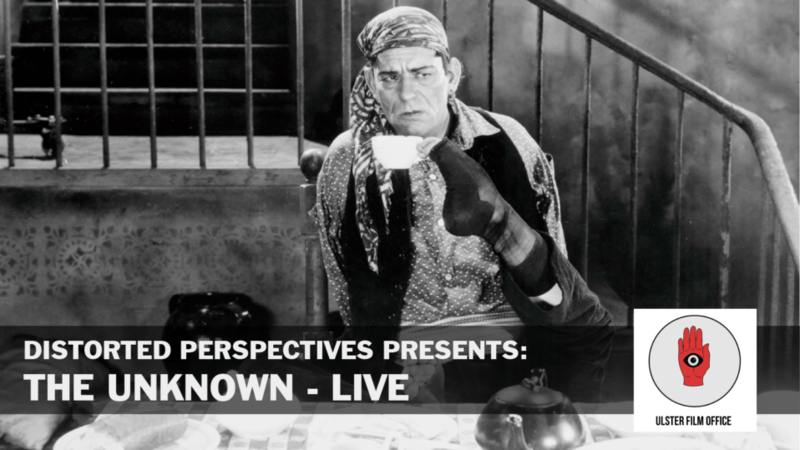 Ulster Film Office, in association with Distorted Perspectives, presents this special screening of Tod Browning’s pre FREAKS amputees, circus midgets and murder love triangle silent masterpiece, THE UNKNOWN, an unsung classic of psychological horror and the macabre. THE UNKNOWN stars man-of-a-thousand-faces, Lon Chaney, in a soul scarring performance as the armless Alonzo, single minded circus knife thrower with a broken past, hellbent on the heart of his performing partner, the glamourous, man hating human dartboard, Nanon, (a jaw dropping pre coat hanger era Joan Crawford) at any cost. This screening will be incorporating an interdimensional sonic treatment performed live by Geier Hitch of THE KITSCH GEHENNA, courtesy of Gamma Pro Forma Records, London.